Ok, I posted a review the other day of a Vantec EZ Swap F4 (model MRK-425ST-BK) in which I noted that the thing screams like a banshee. Well ok, so maybe that’s a bit overly dramatic, but I don’t like noise, and prefer my technology to be unobtrusive, and the fan in the EZ swap is noticeably louder than anything else in my office. So, after some digging in the internals of the bay adapter, I found that the stock fan is an A4010L12S, with a speed of 4k rpm’s and shouting out 25dB of noise. And its not low-pitched thrumming noise, its the small high-pitched noise characteristic of small fans. Luckily for me, there are great sites out there who’ve done the research into fans.. I’ve long been a fan [sic] and reader of SilentPCReview, which sadly seems to be falling by the wayside, with not a lot of forum traffic anymore. Its got some very knowledgeable people, but I guess they never quite got the marketing right? 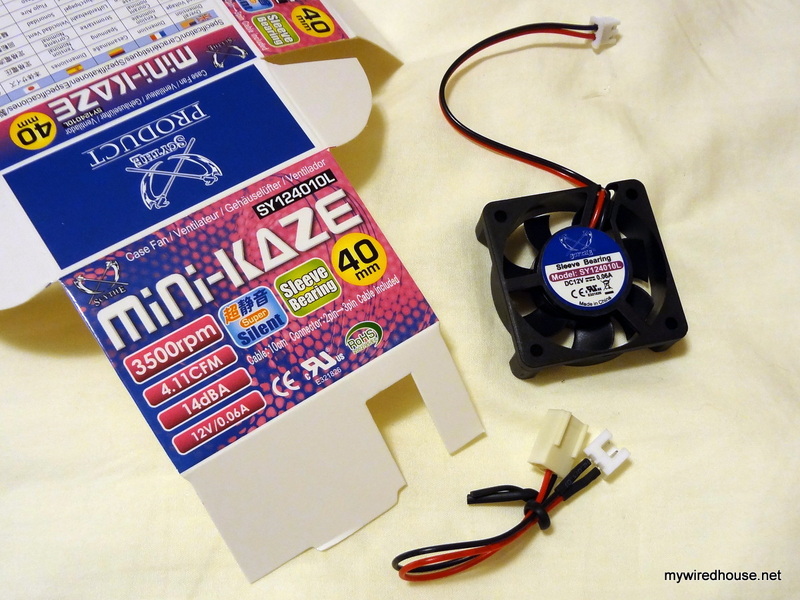 Anyway, after some reading and searching for quiet 40mm fan alternatives, it seems that the Scythe Mini KAZE (SY124010L) is a good option out of the available 40mm x 10mm fans. Its specs are: 3500rpm, 14dB, and 4.1CFM, which means despite being slower and much much quieter, it should still move the same amount of air as the stock fan in the Vantec EZ Swap F4. 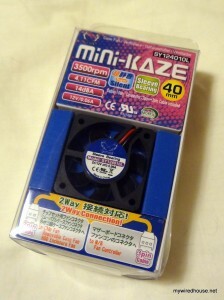 Note – you do not want the “Scythe Mini KAZE Ultra”, as its 20mm deep, and will not fit in the Vantec EZ Swap F4. 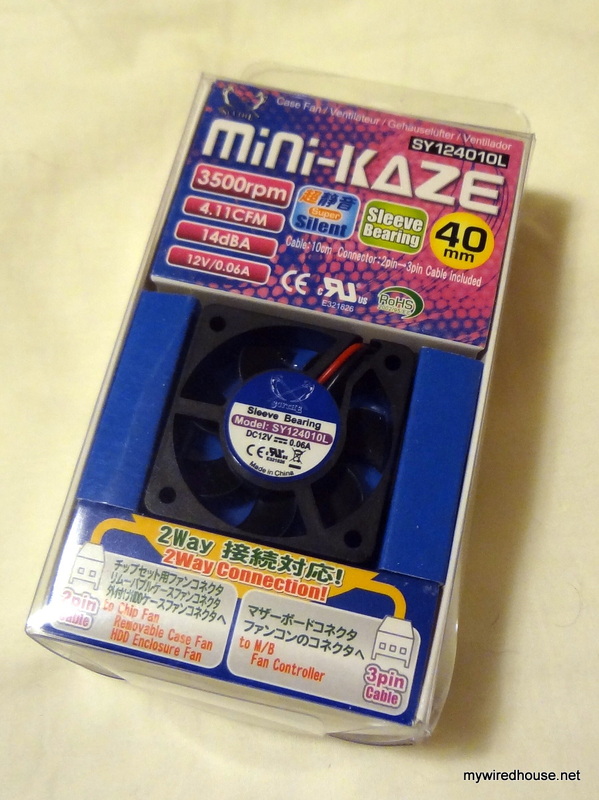 So the nice thing about this Mini KAZE is its alrady a 2-pin fan, so this should be a plug and play replacement for the stock fan inside the drive cage, and at 10dB lower rating, should be much less audible. So, time to whip out the Vantec unit, and swap the fan in it. I won’t bore you with the “how to take it a part” detail – its all self-explanatory, and you can see pictures of the insides of it in my post reviewing the Vantec EZ Swap. So once inside, the original fan just unplugs – its a small 2-pin connector, and a very short lead. 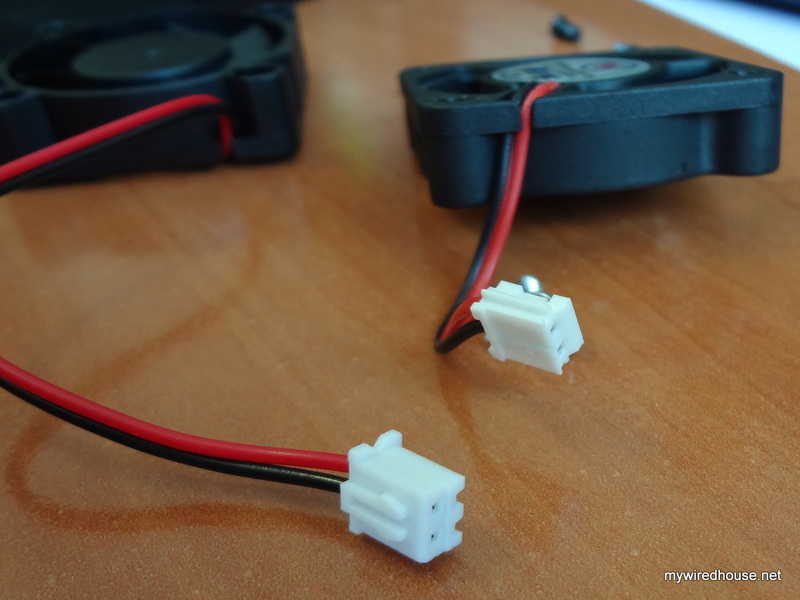 Handily, the mini-Kaze has a 2-pin connector too, and whilst its not exactly the same as the one on the Vantec, the pin spacing is the same, so the modification to make the mini-Kaze fit is easy and doesn’t involve modding the EZ Swap. 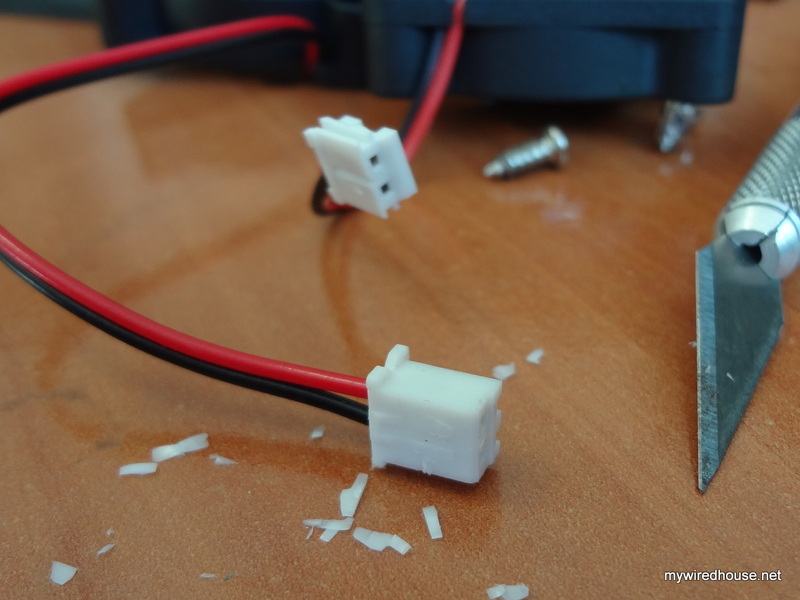 Being soft plastic, the modification is easy enough to make the mini-Kaze connector fit – just trim off the two connector guides so that side of the plug is flush, and it plugs straight into the EZ Swap circuit board. Note the polarity of the wires – you can check against the stock fan’s connector to make sure its round the right way. Once thats done, the whole thing screws back together, and the difference is significant. Its not completely silent but its a lot less noisy, and should actually keep the drives cooler, as the mini-Kaze specs say it moves a greater volume of air at the same voltage than the stock fan. Great article, saved me time researching the correct fan replacement. I just did one of my ez swap 4 (I have 4 of them), this is the first one which the fan started acting up and being very loud. I have had all my ez swap in production for about 2 years and run them 24×7. The one I swapped out was a two pin, just like your article.